An arbitration hearing is something no player, agent or team wants to go through. Kyle Lohse did it twice. As Lohse remains on the free agent market despite spring training games starting later this week, MLB Trade Rumors spoke with the right-hander about his two arbitration cases with the Minnesota Twins in 2005 and 2006 for the first of our six-week series looking back at arbitration hearings from the player's point of view. The dynamic of an arbitration hearing is fascinating. On one side of the long table sits the general manager, his staff, representatives from Major League Baseball, and a lawyer. On the other side sits the player, his agent, members of their staff and folks from the Players Association. At the end of the long table sits the three arbitrators. During Lohse’s first hearing in 2005, the arbitrators were Christine Knowlton, Robert Bailey and Elliott Shriftman. 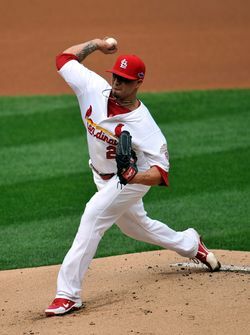 Coming off a season in which he went 9-13 with a 5.34 ERA in 35 games, Lohse filed at $2.4MM for 2005 season. The Twins countered at $2.15MM, a difference of $250K. When the two sides weren’t able to reach an agreement somewhere in the middle, they had no choice but to go to the hearing. As most do during a player’s first year of arbitration, agent Scott Boras used Lohse’s career production up to that point in his argument. The right-hander was 40-39 with a 4.86 ERA but won 13 games in 2002 and 14 games in 2003. The Twins instead focused on his down 2004 season, which included giving up 240 hits and 28 home runs in 194 innings. He also had a 1.63 WHIP. “It’s not a pleasant thing,” Lohse said. “It’s hard to sit there and listen to the lawyer say how bad you are when the GM is sitting right there and you feel like he fed them the info to talk about how bad you are yet they still want you. Each side has an hour to present their initial case before time is given for rebuttals and even surrebuttals. Case in chief books are exchanged before the start and some will even send representatives out of the room to spend the two hours examining the document and working on their rebuttal presentations in advance. Multiple people usually speak for both sides, but rarely do the general managers speak. In Lohse’s case, Twins GM Terry Ryan didn’t say a word. Instead, the club’s lawyer did much of the talking. Boras handled much of the talking himself on Lohse’s behalf. Both sides use charts and diagrams to try and help prove their case. Lohse said the basis of any arbitration case is to find similar players with similar stats and try to compare your case to them. “It’s all about comparables,” Lohse said. “If you can find a comparable that gets you over that midpoint, that’s where you try and pin your case to as a player and they are doing the same thing, trying to pin me to the lowest comparable they can to bring my worth down. Lohse was notified 24 hours after the hearing that he had won and his salary went from $395K in 2004 to the $2.4MM he requested for 2005. But despite the uneasiness in the room and Lohse’s distaste for the process, the two sides were unable to come to an agreement the following year and were forced to go to another hearing. This time Lohse requested $3.95MM while the club countered with $3.4MM. And again, Lohse won. “It’s not a pleasant thing and that’s why you see so many people settling at or around the midpoint because it’s not something you want to go through,” Lohse said. “But in my case, neither time we could get to the midpoint and both cases I won so that basically proves I was worth the midpoint or above. General managers usually reach out to the players in the days following the hearing to ensure no hard feelings are left. The lines are always the same, and predictable. MLB Trade Rumors will look at Marlins catcher Jeff Mathis and his 2010 arbitration case with the Anaheim Angels in next week’s installment.